Quantitative resistance to Globodera pallida pathotype Pa2/3, originally derived from Solanum tuberosum ssp. andigena Commonwealth Potato Collection (CPC) accession 2802, is present in several potato cultivars and advanced breeding lines. One genetic component of this resistance, a large effect quantitative trait locus (QTL) on linkage group IV (which we have renamed GpaIV adg s ) has previously been mapped in the tetraploid breeding line 12601ab1. In this study, we show that GpaIV adg s is also present in a breeding line called C1992/31 via genetic mapping in an F1 population produced by crossing C1992/31 with the G. pallida susceptible cultivar Record. C1992/31 is relatively divergent from 12601ab1, confirming that GpaIV adg s is an ideal target for marker-assisted selection in currently available germplasm. To generate markers exhibiting diagnostic potential for GpaIV adg s , three bacterial artificial chromosome clones were isolated from the QTL region, sequenced, and used to develop 15 primer sets generating single-copy amplicons, which were examined for polymorphisms exhibiting linkage to GpaIV adg s in C1992/31. Eight such polymorphisms were found. 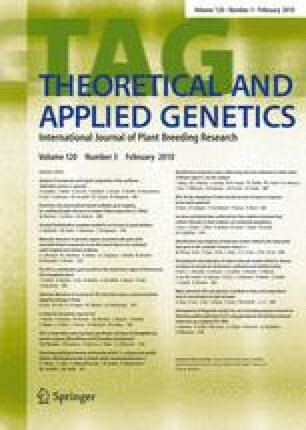 Subsequently, one insertion/deletion polymorphism, three single nucleotide polymorphisms and a specific allele of the microsatellite marker STM3016 were shown to exhibit diagnostic potential for the QTL in a panel of 37 potato genotypes, 12 with and 25 without accession CPC2082 in their pedigrees. STM3016 and one of the SNP polymorphisms, C237(119), were assayed in 178 potato genotypes, arising from crosses between C1992/31 and 16 G. pallida susceptible genotypes, undergoing selection in a commercial breeding programme. The results suggest that the diagnostic markers would most effectively be employed in MAS-based approaches to pyramid different resistance loci to develop cultivars exhibiting strong, durable resistance to G. pallida pathotype Pa2/3. The online version of this article (doi: 10.1007/s00122-009-1185-0) contains supplementary material, which is available to authorized users. CM was supported by a Teagasc Walsh Fellowship during the course of this study. DM is supported by the National Development Plan (NPD) of Ireland. The potato breeding programme at Oak Park (DG) is supported by the NDP and Irish Potato Marketing Limited. GJB and JEB acknowledge financial support of the Scottish Government Rural Environment Research and Analysis Directorate (RERAD). The authors wish to thank Dr Della Milbourne for help with the figures and proofreading the manuscript, Dr Helena Meally for help with fluorescent genotyping of STM3016 and Emmet Dalton for genotyping the HC and SPUD1636 markers.